you arent missing a whole lot in Mississippi, it's just a quicker way to get to casinos. Re: I-269 MS; 2012 Construction Start? Why, oh freakin' why, do public officials insist on hyperbole?? The actual route of the I-69 extension is only going from the Tex-Mex border to Indianapolis...nowhere else. And this segment only will run from I-55 to roughly the the Tennessee border. Maybe Mississippi is just jealous that the Outer Memphis Bypass/I-269 didn't get the full I-69 designation?? Although the article talks more about an economic impact study of I-69/I-269, it is good to see that MDOT is anticipating building their portion of the loop in 2012. This bodes well for I-22 as well, since for the time being this loop will provide the other interstate connection needed for I-22 to become a reality.. I've seen many of such road project maps where a tiny village is shown as THE crossroad between major continental destinations. They're actually fun! that's Indiana in general. 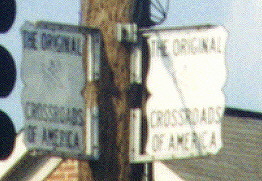 Crossroads of America? Really, when did they annex Chicago? Do you have one or two favorites that you can share with us? 3. Even though MS I-269 is planned to have eleven exits, it is primarily intended for freight, not local, traffic. ... Kevin Tilbury with Gresham Smith and Partners said the trade corridor comprises a two-mile area north and south of I-69/I-269. "This will be the focus of a study area for the next year and a half," Tilbury said. Tilbury said floodplains make up 22 percent of the corridor area and about 3 percent comprise wetlands. More than 126,000 acres are located within the study area. Tilbury said from his observations, other east-west corridors are needed to take the pressure off the I-269 when completed. Presently, I-69 stops at I-55 where I-269 will one day connect. Right-of-way has been acquired for the roadway but no construction on I-269 has begun. "We want to keep as much local traffic off of it," Tilbury said, explaining the trade corridor is meant to transport goods and products from Mexico to Canada. "You can't make I-269 your main local road. It's not set up to do that," Tilbury said. Dale said the completion of I-269 represents a golden opportunity. "There (will be) 11 new interchanges with virtually nothing around them," Dale said of the entire I-69/I-269 stretch through eastern DeSoto County to Tennessee Highway 385 near Collierville. "It's pretty amazing to plan a corridor like this with 11 interchanges. We talk about the corridor as a blank slate. This is a tremendous opportunity. We hope to do it right the first time." Planning Commissioner Robin James said DeSoto County officials are taking pains to make sure planning is done correctly. "I don't think anybody wants to see this thing covered up with warehouses," James said. "Corporate offices would be great." The real question with the I-269 Memphis Loop is if the northern crossing will be built due to how clost it is the a preserve and state park. If I-269 was truly intended for freight/long-distance traffic, they wouldn't have 11 exits along it. It'd be more along the lines of 6. Construction of I-269/SR304 from South of SR 302 to the Tennessee State Line, known as Federal Aid Project No. STP-0029-03(010) / 102556305, in the County of Marshall, State of Mississippi. I wonder if TDOT will now go ahead & complete short section from Mississippi state line to TN 385 near Collierville? It appears the contract is for grading and bridge work by looking at the plan index. It was only 15 months ago that Hill Brothers Construction Co. of Falkner, Miss., was awarded a $53.47 million contract to complete the grading, drainage and decking for the nearly eight-mile stretch of highway from near Macon to Tenn. 57 at Collierville. The project encompasses eight bridges, including one that's 3,200 feet long over the Wolf River and the swamplands surrounding it. The work was expected to be finished in September 2012, followed by a six-month paving project the year afterward. But Hill Brothers already is nearly two-thirds done with its work and could be finished by early 2012, meaning paving could be completed next year, as well. "They've had some good construction weather," said Jason Baker, project manager for the Tennessee Department of Transportation. Known in various sections as Paul Barret Parkway and Bill Morris Parkway, Highway 385 forms an approximately 50-mile-long horseshoe arcing from U.S. 51 in Millington eastward to Arlington, southward to Collierville and then back westward to Interstate 240 in southeast Memphis. They have been doing this with a lot of "Future" Interstates. If they have a StreetView car catch a shot of one of those "Future Interstate" corridor signs, they just go ahead and place the Interstate shields on the map. Kinda stupid if you ask me because you can't always tell what's a real Interstate and what's not if you're not a roadgeek. BTW, did you also notice that they also removed most of US-52 too? You can hardly find any US-52 shields except on it's bannered routes plus up in sporadic shields. Most of the time, you'll only find the "US-52" text to let you know about it. It's also been this way for a couple of months. Just like the I-136 thing. I-269... is it Memphis' Outer Beltway?